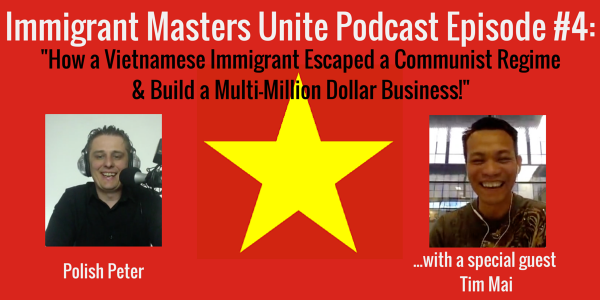 IMU 004 : How a Vietnamese Immigrant Escaped a Communist Regime & Build a Multi-Million Dollar Business! | Immigrant Masters Unite Podcast: Transform Your Business, Life and The World Around You! In our next episode of Immigrant Masters Unite, Polish Peter interviews Tim Mai, an aspiring, transformative and extremely successful real estate investor and mentor. Tim is an immigrant who escaped the communist Vietnam with his family when he was 12. You’ll hear his amazing story including how they ended up in jail, what people would go through to escape, his boat adventure and how he build his business. More importantly, you’ll learn how to hacked his growth to become such a successful business owner right here in United States. You’ll also discover how to breakthrough fear, how to handle it, the stories we tell ourselves that keep us away from being successful and how you can hack your own growth not only in business but in personal life as well.